Product review: – by Andrew's First Flight, 28 Nov 14 5/5 Excellent "No problems in contacting operator, no problems in arranging date. Did no have to rearrange date. My parants organised the event, and as they live in Solihull, Wellesbourne was easy to find. The family came to enjoy the experience and were well looked after while I was enjoying myself. Staff were great and the helicopter was in good condition lets face it its got to be. The briefing was very clear and concise. Thrilling doesn't explain the feeling it was orsom never experienced anything like it before - spent the evening flying my armchair around the lounge. Would recommend it to anyone and would love to do it again. Lots of photos by the family, no pressure to leave. Initial contact was made through site, EXPERIENCE4ALL staff were very helpful. " No problems in contacting operator, no problems in arranging date. Did no have to rearrange date. My parants organised the event, and as they live in Solihull, Wellesbourne was easy to find. The family came to enjoy the experience and were well looked after while I was enjoying myself. 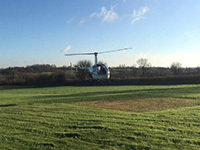 Staff were great and the helicopter was in good condition lets face it its got to be. The briefing was very clear and concise. Thrilling doesn't explain the feeling it was orsom never experienced anything like it before - spent the evening flying my armchair around the lounge. Would recommend it to anyone and would love to do it again. Lots of photos by the family, no pressure to leave. Initial contact was made through site, EXPERIENCE4ALL staff were very helpful.